The bad blood between lions and spotted hyenas runs deep, and is one of the most celebrated rivalries in nature. Their gory competition over carcasses on the African savanna has been memorialized in numerous wildlife documentaries like Beverly and Derek Joubert’s classic Eternal Enemies. “Eternal” is obviously a bit of an overstatement – the competition between the species has only existed as long as both have been around – but fossil evidence from prehistoric Europe at least partially documents how far back lions and hyenas have been snarling at each other. Not so far into the past, during the days of the Late Pleistocene prior to 12,000 years ago, both lions and hyenas lived in Europe. Thanks to the fossil record, paleontologists have known this for the past two centuries. The British naturalist William Buckland made a name for himself in academic circles by teasing out the secrets of hyena-chewed bones found in Kirkdale Cave, and in 1810 the German paleontologist Georg August Goldfuss initially described what would come to be known as the “cave lion” – Panthera leo spelaea. (We now know that this name is a little misleading. The lion did sometimes occupy caves, but more often tread across the dry grasslands and through the boreal forests of Eurasia and has been recast as the “steppe lion.”) The confrontations which take place on the savanna of Botswana today used to be played out on the cool steppe of Germany, and a paper just published by paleontologist Cajus Diedrich lays out some of the evidence. Between 1958 and 1976 a cache of about 4,000 Pleistocene mammal bones was excavated along a stretch of the Emscher River near Bottrop in west-central Germany. This collection of bones has served as window into the ecology of the area more than 37,000 years ago – bite marks and other damage to many of the bones has led Diedrich to the conclusion that the area was a place where hyenas violently dismantled the carcasses of their prey and raised their cubs. But lions were there, too. There are two lines of evidence which place lions at the Bottrop-Wellheim site in northwest Germany – the bones of the animals themselves, and a rare trackway impressed with the pugmarks of a prehistoric lion. The roughly 40 foot track slab contains 29 footprints left by an adult steppe lion – 12 of those being corresponding forefoot and hindfoot sets – and, since tracks are given their own genus and species names to help organize track types, Diedrich has given this track type the name Pantheraichnus bottropensis. The lion tracks are impressive, but the distinctive evidence of the lion’s antagonistic encounters with hyenas is to be found in the bones of the big cats. Frustratingly, though, lion bones are rare at the site, and poor recordkeeping has obscured the provenance of some of the bones thought to have come from the vicinity of the Bottrop quarry. (This is why notes, quarry maps, and locality data are so important in paleontology – context can be the key to investigating the relationships between prehistoric creatures and the environment they were preserved in.) Diedrich mentions a few finds from the Bottrop quarry – teeth, skull fragments, vertebrae, limb fragments, and the like – that he attributes to one cub, two adult females, and one adult male — but he also looks at the larger sample of lion remains from other open-environment sites in northern Germany. Primarily citing his own work, Diedrich notes “An increasing number of lions remains, including partial skeletons, are being recognized from late Pleistocene hyena den sites in Central Europe.” More than that, many of the lion bones show evidence of being chewed by the spotted hyenas. There are lion skulls with parts cracked off, lower jaws which show a consistent pattern of breakage, and limb bones that have been nibbled, all of which match up with the specific strategies hyenas use to dismantle bodies. The feeding hyenas did not do anything special when dining on lion – the pattern of damage on the lion bones is similar to that seen on horse, rhinoceros, and elephant bones, meaning that the hyenas stuck with their system for breaking down bodies. 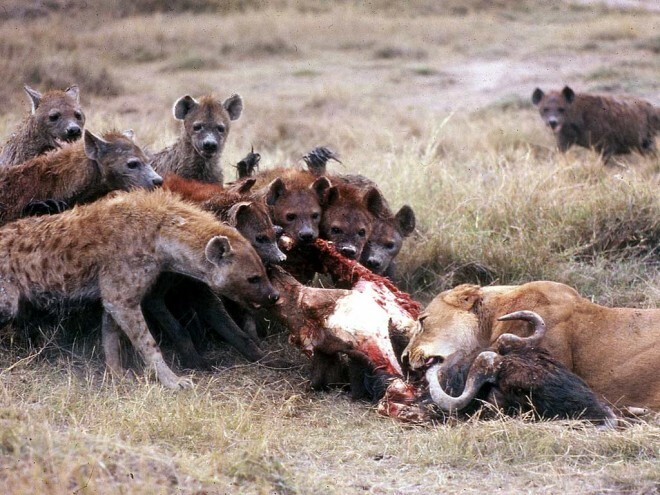 Spotted hyenas scavenge a lion carcass at an open-air, grassland site in Pleistocene Europe. Image by G. “Rinaldino” Teichmann and from Diedrich, 2011. But why are many damaged lion bones found in association with supposed hyena den sites? Diedrich proposes that the lions were killed in fights with hyenas over carcasses, and, loathe to let fresh meat go to waste, the hyenas dismembered the lion bodies and carried back parts of the lion back to their dens. Alternatively, the hyenas may have simply scavenged lions which died due to other reasons. Either way, hyenas actually played a role in the preservation of the lions by bringing the bones of the cats back to sites where preservation was more likely. (The Homo erectus fossils of Dragon Bone Hill in China were probably accumulated by giant hyenas in a similar fashion.) Perhaps observations of modern lions and hyenas may help explain which scenario was more important in terms of lion bone accumulation by hyenas. After all, lion bones are occasionally found in hyena dens even now, and, in this case, the behavior of the living animals may act as a key to unlocking the lives of their extinct relatives. Top Image: Tug of war – a lioness competes with hyenas for a gnu carcass in Tanzania. Photo by Flickr user kibuyu.